While corded electric and cordless snow blowers are becoming more capable each year, for many people the only realistic option for clearing snow from sidewalks, driveways and yards is a gas snow blower. While they are generally more expensive, both to buy and to maintain, than electric snow blowers (though not always), decent gas snow blowers are more powerful, often larger, and capable of clearing more snow than the best electric blowers on the market. Our pick of the best two stage gas snow blowers available is the Husqvarna ST224P. 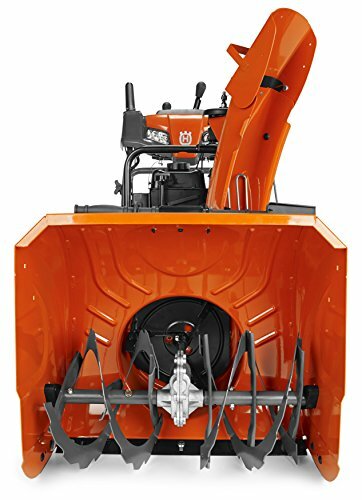 Unless you have a very small or very large area to clear, we think this is the best gas snow blower for most residential users. It's powerful, solid, and easy to use, despite it's size. Our runner-up is the Briggs & Stratton 1696619, a slightly larger (27") snow blower than our #1 pick, though we feel it's slightly less capable than our winner. If you're on a budget, the YARDMAX YB6270 will give you most of the performance of the ST224P (though without the power steering) at a lower price, though we're not convinced the quality is up to Husqvarna's level. If you have a smaller area to clear, but still want the power of a gasoline engine, have a look at the 21" Troy-Bilt Squall, our favourite single stage gas snow blower (snow blower makers have abandoned gas engines for anything smaller than 20" width). We believe the Husqvarna ST224P is the best gas snowblower for most people. While everyone’s circumstances are different, and there will be more suitable choices for people in different situations (if you have a very small or very large area to clear, look elsewhere), this impressive machine should be able to handle pretty much anything you can throw at it. There's nothing else at this price point with robust, all-metal body construction, power steering, heated grips and electric start. This model has power steering (that’s what the P stands for - the older model ST224 without power steering is still available at a lower price). The power “steering” is not steering like you’d have in your car - it’s just a way of forcing the back wheels to turn at different speeds, which forces the blower to turn. Steering is controlled by separate levers, one on each handle, and it does make a huge difference to the operation of a big, heavy piece of machinery like this. The blower feels like it can turn on a dime - it can almost turn 180 degrees in its own length. There is a built-in headlight see you can clear the snow in the dark, and if you need to adjust the chute direction or the deflector height, there are remote controls for both functions. The ST224P has an electric starter, so the days of pulling a cord with all your strength until the engine (reluctantly) starts are in the past! Electric starters on most gasoline snow blowers are slightly unusual - there is no onboard battery like you'd have in a car, so you have to connect the snow blower to a 120V electrical outlet using an extension cord, to provide power to the starter motor. Once the engine has started, you can disconnect the extension cord and you're free to go. There is a pull cord starter as a backup. You should always use a GFCI power outlet when you connect outdoor power equipment to the mains. This is especially important for equipment used in wet conditions, such as snow blowers. Also, make sure you buy an extension cord rated for both the power requirements of the snow blower, and the temperature you'll be using it in. Most extension cords are not rated for outdoor use in cold weather, and their insulation can become brittle and even break if they get too cold. Check the tire pressures - they should be OK but they may have been over-pressured for shipping. Set them to 14-17 p.s.i. One advantage of this size of blower, and of this model in particular, is that it will fit through a standard door. If your only access to your backyard is via a door, that might be an important consideration for you. Huaqvarna recommend this blower for 6-18 inches of snow, but there are some reports of people using it to clear snow up to 3 feet deep. If this is your intention, it's more likely to work with fresh, powdery snow - try to get the snow cleared first thing in the morning, before it goes through a cycle or two of freezing and thawing again. One of the most common complaints with this snow blower concerns the heated handlebar grips - they're lukewarm at best. Thick winter gloves solve the problem, but this can make it awkward to use some of the smaller controls. If you're using the blower in extreme cold conditions, the chute cable can ice up. This is caused by moisture getting into the cable and freezing. If you're affected, you could try spraying a small amount of WD-40 or antifreeze into the cable sheath. Storing the blower away from moisture, and allowing it to dry out completely will also help. There was a problem with the auger drive belts in late 2015 / early 2016, causing them to wear out & snap prematurely. This has been traced to a bad batch of belts, and has now been fixed. It's always a good idea to keep spare drive belts and shear pins on hand, just in case, as these are the most likely parts to need replacement. Finally, the gas tank is on the small side at 0.71 gallons, which can be frustrating if you have a particularly large area to clear. Originally founded in Sweden in the 1600s to produce firearms, the Husqvarna group has changed somewhat in the last 330 years! Diversifying through such products as sewing machines, kitchen equipment and bicycles, in the 20th century Husqvarna became one of the largest manufacturers of outdoor power tools & equipment, before being acquired by the Electrolux group in 1978. Other brands owned by Husqvarna include Gardena, McCulloch, PoulanPro, WeedEater and Flymo. Husqvarna back this snow blower with a 3 year warranty on the machine, and 5 years on the engine. The Briggs & Stratton 1696619 is a two-stage gas snow blower. This model has a 250cc engine with electric start. The width is 27", and the maximum intake height is 20". This makes it slightly wider, slightly less high, and slightly more powerful than our no.1 pick. Depending on the price difference, this may be an option for you, but usually we find the price difference between the two models is small, and we’d recommend the more powerful 1696619. The 1696619 lacks the power steering offered by Husqvarna, though there are other Briggs & Stratton blowers with power steering. We prefer the Husqvarna, but if you can find the Briggs & Stratton snow blower at an attractive price, and the ST224P is out of stock, the B&S model is a capable alternative. Although B&S is an American company, in this case the snow blower and engine are designed in the USA, but both are manufactured in China. As with all gas-powered tools, make sure the oil level is correct before you start it up for the first time – these snow blowers are usually shipped with the oil drained. Who Are Briggs & Stratton? Briggs & Stratton is primarily an engine manufacturer (making around 10 million engines every year). Based in Wisconsin, B&S now operates manufacturing facilities all over the world. The company has existed since 1908. The 199619 has a 3-year warranty on both the machine and the engine. Most of the performance of our #1 pick (minus the power steering) at a much lower cost. The YB6270 even looks similar to the Husqvarna, with its orange color. There are 22” and 26” models available too – the 22” is stripped out (smaller engine, no electric start) but at an attractive price point. The 26” has more features (all the features of the 24” model, plus a dashboard & heated grips), but is priced higher. The YB6270 is made in China, and is clearly built to a price, however it appears reasonably solid and well-built for the money. It is significantly cheaper than the Husqvarna and Briggs & Stratton equivalents. If you’re looking for a budget snow blower with full-size performance you won't find much better than this one. Yard Max offer a 2-year warranty on both the machine and the engine for residential use (90 days if you use if for commercial purposes). The small gas snow blower market seems to have been abandoned in the last few years - previously there was a Toro 18" gas-powered single stage blower available, however it seems to be discontinued - to be honest, it didn't get great reviews anyway. If you have a small area to clear & you insist on gas power, the Troy-Bilt Squall is the best in this category. It's a single-stage snow blower, so it doesn't have the separate impeller that the other machines in this review have, but the trade-off is a lower purchase price, smaller size, and less weight. This blower is still capable of clearing a small driveway or a short length of sidewalk, but if you have a larger area to clear regularly, we'd look elsewhere. It's recommended for up to 6" of snow, though if the snow is light and fluffy, it is capable of clearing over a foot in depth. Troy-Bilt is an American company, founded in 1937 and based in Ohio. It was acquired by parent company MTD in 2001. The Troy-Bilt Squall has a 2-year warranty on both the machine and the engine. 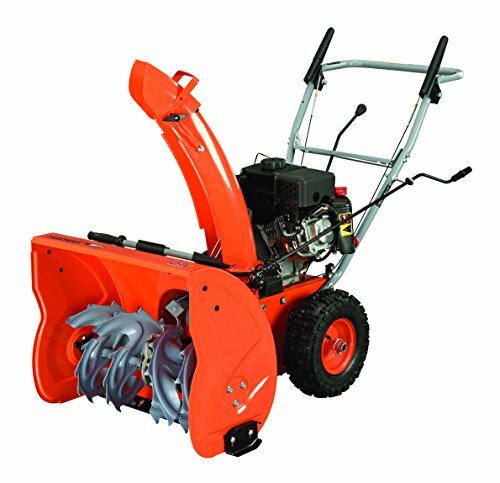 Gas snow blowers are available in single-stage, two-stage and three-stage versions. The main problem with the single-stage concept is, the power and rotating speed required to efficiently pick the snow up from the front of the blower can be different from what's required to push the snow through the chute. With a single-stage blower you're stuck with one speed for both tasks. Single-stage blowers do tend to be cheaper, smaller and lighter than two- and three-stage models though. For more information, have a look at our article comparing single-stage vs two-stage and three-stage snow blowers. 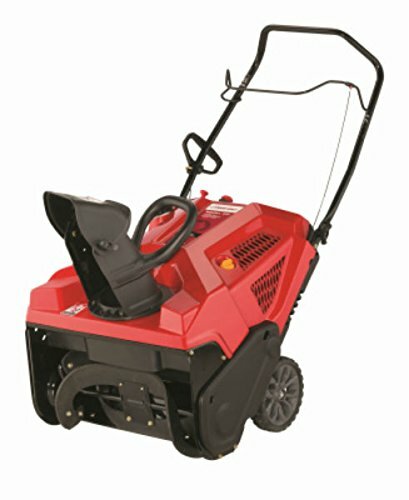 Most gas snow blowers on the market (at least those intended for domestic use) are in the 5hp – 7hp range. More power is better in most cases, as long as the increased size & weight associated with bigger engines doesn’t become a problem. 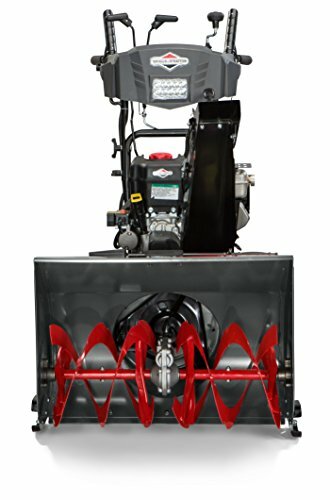 Make sure if you’re buying a gas snow blower, you get a self-propelled model (where the engine drives the wheels, and moves the snow blower through the snow, as well as turning the auger and impeller). Most gasoline blowers weigh well over 100lb, so using 100% human power to maneuver them over slippery services, and up and down inclines, is not realistic for most people. Some of the heavier and more expensive models have power steering. This can aid maneuverability, particularly for the less tall & muscular operators. It’s a worthwhile feature, providing you don’t pay too much extra for it. If you have a small area to clear, and / or limited storage space, the physical size of the snow blower will be an important factor to consider. Make sure the discharge chute can be rotated through at least 180 degrees, and check how the discharge chute operates – most owners prefer a handlebar-mounted control, which lets you change the chute direction while you're clearing snow, rather than the older hand-crank system that forced you to stop clearing every time you wish to adjust the chute. As with all power tools, it's important to be safety conscious. As well as the usual guidance about wearing hearing protection, gloves and sturdy boots, there are additional risks caused by the auger and chute. Don't wear any loose clothing that could get caught in the auger. Be aware of where you aim the chute - blowers can pick up gravel and other small items and throw them a surprisingly long way, so you need to be aware of people, pets, windows and other items in the area. Don't allow children to operate the blower, and make sure the snowblower is turned off at the control panel before trying to clear a blockage in the auger or chute. Never use your hands to clear a blockage - always use the clear-out tool supplied with the blower. Make sure you read and follow all the manufacturer's instructions before you operate the blower. When you buy a gasoline-engined power tool, you need to accept there will be quite a bit of ongoing maintenance, at least compared to an electric equivalent. You should check the blower for loose or worn parts before every use. Pay particular attention to the scraper blade, slide shoes and auger. Also make sure the engine oil level is correct before you start the engine. If the auger & impeller don't turn, check the shear bolts first - they are designed to fail if anything gets caught in the blades, to save expensive damage to your snow blower. It's a good idea to keep a few shear bolts on hand. Some snow blower owners suggest spraying silicone lubricant or WD-40 on the blower's body and deck - this makes it much easier for the blower to slide and cut through the snow pack. If you're mechanically-minded, you can do quite a lot of the maintenance at home. See this article from Jack's Small Engines on how to change the oil in a Husqvarna snow blower. There were no recalls listed for any of the snow blowers in this comparison at the time of writing (January 2019). However, it's always a good idea to check the latest information at the Consumer Product Safety Commission website before buying any large, expensive or potentially dangerous product. Do you own any of the gasoline blowers mentioned here? Did you choose a different one? Let us know in the comments!